Dr. Renske Gelderloos, from Oxford University, has posted more accounts of data collection from the CCGS Larsen (including a description of rosette operations by our own Pat Ryan). Read her copied posts below, or follow her accounts at her blog directly (where there are additional photos from the area, taken in 2009). Two days of CTD sections. We actually need to work on the weather stations as well: there is a weather station on Cape Baird that needs to be dismantled and relocated to Joe Island on the other side of Nares Strait. Access to a weather station, however, requires a helicopter and the weather has changed from its lovely sunny side to a cloudy and windy variety. There is either far too much wind for the helicopter to fly, or it is foggy and then we can’t fly either. The main activities are therefore centered around taking CTD profiles, which, by the lack of other activities and the need for a deck crew for the rosette system, is now a daytime activity. We take one section just south of Petermann Fjord, and one further north in Robeson Channel. The latter section is extra nice because this part of Nares Strait was often too much ice covered to access for taking measurements in previous years. In the late afternoon of 8 August the FRC (the small boat) is sent out into Discovery Bay to try and recover a tide gauge pressure mooring that had been there since 2003. In that year, a diver from the American ship ‘Healy’ installed this mooring. In 2006, when the first next ship for scientific purposes came up here, the bay could not be reached because of heavy ice conditions. In 2007, during the expedition thereafter, the science crew flew to the bay by helicopter and successfully talked to the mooring and released it, but it has never come to the surface. In 2009, on the third expedition after deployment, heavy ice conditions again inhibited access to the bay. Now, in 2012, we decided to take the absolute longest of long shots in trying and recover this mooring (if the bay would not be frozen over) using a sinking line and try and ‘catch’ the mooring. As we knew the exact location, it was at least worth trying. So, the FRC was sent into Discovery Bay and came back later that evening, to everyone’s astonishment, with the mooring on board that had been happily recording data for the full nine years it had been there in the water! (In an attempt to be creative I naively inquired whether it would be an option to land the FRC on the beach below Cape Baird and walk to the weather station. Given the steep slope and significant height of the plateau, this idea was quickly discarded.) The success with the Discovery Bay mooring was later celebrated at the bar. One of the ways oceanographers study the sea is through the collection of water samples. Chemical oceanographers evaluate the characteristics of water to provide information on the source of the water, contaminants and conditions of the sea to sustain life among other things. The collection of water aboard the Larsen is done in a contraption we call a rosette. It’s comprised of a number of Niskin bottles (large cylindrical plastic bottles), in our case 12, held upright in a large round metal frame. Our rosette is about as tall as I am (170 cm). As the device is lowered into the ocean, all of the bottles are open at both the top and the bottom so that there are more cylinders than bottles. As the rosette is lowered, water flows freely through the open bottles as if they were pipes… stoppers at each end are connected to a tension-based triggering device that can close both ends instantaneously – thereby capturing the seawater residing at the depth of the rosette at the time of firing. On the deck, connected via wire to the rosette, is a computer that sends a signal to each of the bottles when the operator wants to capture water. Our rosette is typically lowered at a controlled rate to the bottom of Nares Strait collecting samples on its descent and then quickly brought back up. Attached to the rosette is also a CTD device that continuously provides salinity, temperature and depth information to the operator. Physical oceanographers use these data to analyze aspects of the sea and for the water collection purpose this information is vital to collect samples (that is to trigger the closure of bottles) at specific depths. All of the heavy work of wrangling the rosette off and then back onto the deck of the ship is done by the deck crew of the Henry Larsen. Garbed in bright orange jumpsuits and hard hats, the crew pilot the heavy and cumbersome rosette to a gentle landing after each cast. They are a great group of guys who regale us with tales of the sea, and places back home (Newfoundland for most of them) and make us laugh to the point that we sometimes even forget how cold our hands are! While the deck crew is managing the heavy work of the rosette, one of the science team members, Jo, mans the winch, hoisting, lowering and then raising the rosette up as directed by another member of our team, Renske. She operates the computer, carefully monitoring the graphics which tell her where the rosette is at all times. It’s Renske who determines when each of the bottles fire. As soon as the rosette is safely back aboard, the piddlers get to work. We are members of the science crew assigned to get the samples from each Niskin bottle into the pre-labeled sample bottles. First, we check that the bottles have fired properly and that there are no signs of leaks that would indicate a sample was compromised. Then a group of us (3 is a nice number – as it speeds up the process and is not so many that there are traffic jams on the deck) set about the task of filling various glass and plastic vials with very cold ocean water, these will be shipped to a lab for analysis when we port. The label in each bottle indicates the location and depth at which the sample was collected as well as which type of analysis is to be performed. On this trip we are sampling for O-18, Barium, Salinity and Nutrients. Protocols to insure the integrity of the sample for each analysis are followed – some of the samples must be immediately frozen and kept at very cold temperatures. Others require specialized gaskets to prevent oxygen transfer. Duplication of some samples provides for quality control check performance. Every time the rosette is deployed, we typically fill about 50 bottles. Each of the bottles is rinsed with the sample several times prior to being filled – as we dump this rinse water onto the deck, this process can lead to wet shoes and socks when the wind is blowing hard as it was yesterday. In the Arctic, this water piddling as it is “affectionately” dubbed can be chilly, wet work. Your hands can feel like you might not get sensation back for days and on a windy day (as we had yesterday) the water can be blowing in sheets to soak you. That being said, it can also be an enjoyable group endeavor. Our lead scientist often joins us filling bottles and Renske will lend a hand as time permits. There is a frenzy of activity when the rosette alights upon the deck that feels like work but the camaraderie of the piddlers and the tendency to easy laughter among the group actually makes it some of the fondest (if perhaps coldest) memories of my Arctic experience. When I woke up this morning, the wind had not settled down. Quite the opposite to be honest: For the first time since we left Thule the boat was significantly moving in other directions than forward. Taking the helicopter to Cape Baird was absolutely out of the question, and the usual 8-o’clock science meeting was cancelled because it did not seem we would be able to do anything in this weather. I took a cup of coffee to my cabin and wrote a bit on this blog. After finishing I decided to go up to the bridge to get the latest info on the state of affairs. At the bridge it turned out that the idea to take the FRC to shore and climb up the cliff was being considered more seriously. Apparently, something that is considered impossible one day is suddenly not such a bad idea the next one out here. I was asked to come along and immediately agreed! I knew it would be a tough climb and a windy exercise on the plateau, but this unique opportunity to walk up a glacial outlet and be part of this, admittedly, somewhat absurd plan, I did not want to miss for the world. The carefully-put-together list of absolute essentials to dismantle a weather station was, figuratively speaking, thrown overboard and replaced by a light-weights-only list, as we would have to carry everything up the hill. The magnitude of the team was now determined by the number of people required to carry tools up the hill and tools and a dismantled weather station down the hill. The science team was therefore expanded to four (Humfrey, Dave, Andreas and me) and a crew member with a shotgun (Melvin) was added to the team in case of a polar bear attack. Chief officer Brian, aided by seaman Derick, skillfully maneuvered the FRC from the ship to the beach below the cliffs (while making sure we all got absolutely soaked were it not for our waterproof floater suits), where we jumped out of the boat onto the beach with our backpacks. Ever since a large piece of the glacier tongue of Petermann Glacier broke off on the 22nd of July (now commonly referred to as ‘the ice island’), we have been anxiously monitoring the movement of this island. The event gives us both opportunities and threats: We are studying the ocean circulation (and its effect on glacial melting) in this fjord. This piece of the glacier breaking off may give us the opportunity to take measurements in a previously covered and therefore inaccessible area. The last time a ship went here to take measurements was in 2009, and incidentally two large calving events have taken place since then (the first one being in August 2010), so really a large part of the fjord that was previously covered under ice is now accessible by ship. On the other hand, the island can block the entrance to the fjord altogether and we may not be able to get in at all. We are close to the ice island now and are very curious to see it. The news of the piece breaking off made the TV news all over the world, but we are probably the first people to see the island in real life. The captain announces this long awaited moment by: “All ship personnel, all ship personnel; there is a little piece of ice next to the ship if you’re interested”. The bow quickly crowded with people with cameras taking lots of pictures. By the time this ice island will reach the more inhabited part of the world (say Newfoundland) it will have been broken into smaller pieces and not be so gigantic anymore. This ice island breaking off of the ice tongue of Petermann Glacier is not necessarily a dramatic and life changing event. This glacier tongue loses 80 to 90% of its ice through melting from below, because the ocean water is relatively very warm (don’t get too excited now, it is only about 0.2 degrees Celsius so not particularly hot-tub temperatures). Calving of ice from the edge is only responsible for a tiny fraction of the total ice loss. That being said, if the glacier continues to calve off ice, this may be different in the future. After the ice-island sight-seeing moment it was time for dinner (or ‘supper’ as it is called on the ship). Supper time is quite early, from 16.30 h to 17.30 h. Chief scientist Humfrey decided on a night-time CTD section (up to about midnight) in the alongside direction of the fjord, away from the ice island and away from the fjord. Tomorrow we will see whether we can go into the fjord and do the rest of this section and another one. Things don’t look good though: the ice island is completely blocking the northeast side of the entrance, while the southwest side is stuffed with thick multi-year ice. But first to bed, and we will see what happens in the morning. After a short night I woke up this morning for regular breakfast hours between 7 and 8 am. It became clear that we would not be taking measurements in at least the next few hours, so I took the opportunity to catch up on some sleep. After about two hours I was woken up in a not-so-gently manner by the ship’s crushing the thick multi-year ice in the southwestern part of the Petermann Fjord entrance. After an ice reconnaissance flight by helicopter the captain had decided that it was safe to go into the fjord, provided the ice flights were repeated every hour to make sure the ice island did not rotate southwards and close off the whole entrance. This was the first time I saw the boat in action as a real ice breaker: breaking ice. Quite an experience I must say! Thick floes of ice were crushed by the ship’s bow and pushed sideward. The landscape around us is breathtaking: steep cliffs on both sides of the fjords, on top of the cliffs theGreenland ice sheet, large ice bergs that have calved off from Petermann Glacier in the ocean around us, smaller glaciers flowing into the fjord, and the rest of the ocean around us covered in thick ice floes. The wideness and calmness is amazing. The passengers on the helicopter flights today get a real treat. Apart from the amazing landscape a large group of narwhals (whales with long pointy noses) is spotted. I stay on deck for a long time just to admire in silence. It takes to halfway the afternoon for the boat to break its way through the ice to the vicinity of the edge of the glacier tongue, where we start a CTD/rosette section across the fjord. I asked Humfrey to add some stations to the schedule, even it would only be the top few hundred meters, to better resolve possible finer structures in the fjord. He agreed and added a ‘shallow’ station in between every planned station, warning us though that the whole operation would then take up to 1 or 2 o’clock in the morning. As I really wanted this data I was willing to stay up that late. Apart from the CTDs and rosettes, which tell us something about the water properties and currents in the fjord, we also want to know what the underwater topography (known as bathymetry) looks like. The only information we have is from previous ships in this area, and that information is extremely limited. We basically don’t know more than that the fjord is at least over 1100m deep and that around the entrance the deep part is separated from Nares Strait by a shallow sill, probably no deeper than 450m deep. Therefore we zigzag from station to station, while recording the depth soundings from the ships. The ship’s echo sounder sends a sound signal out to the bottom and waits till this signal returns. From the time it takes to go to the bottom and back, combined with the speed of sound through the water, the depth of the water under the ship is calculated. So, while covering as much ground as we can, we basically map the bathymetry of Petermann Fjord. Knowledge about the bathymetry is of vital importance to be able to make reliable computer models of the ocean circulation in the fjord. The zigzagging had one minor disadvantage: it took almost an hour to get from one station to the next. Most of the science team had gone off to bed or for a drink at the bar around 10 o’clock in the evening, while Andreas handled the winch and I monitored the CTD-recordings on the computer screen. Humfrey was also still dedicated to the science being done, but after being satisfied that the depth recordings of the bridge went well around 3 am, he went to bed as well. Although the deep stations were a bit boring to perform (looking at a wire unrolling for 20 min, and then rolling up for 20 min), the data was very exciting and we spent the time in between stations plotting the data, discussing, and going back and forth between the processed data and the rough profiles to see what features were real and which ones may be an artificial side effect of the plotting procedure used. When the last station was finally completed and we finished moving equipment into the container, it was 5 o’clock in the morning (slightly later than the scheduled end time). I decided skipping breakfast in the morning would be an excellent idea and went to bed for a good morning of sleep. This is a wonderful description by Dr. Renske Gelderloos of Oxford University of what mooring recoveries are all about, taken from her blog. Today is mooring day! My function on board has officially been changed from scientist to full-time photographer for the day. We want as many photos as we can get from the equipment as it comes out of the water, so that we can always go back later and see if something happened before, during or after the recovery. And it is a beautiful sunny day; very photogenic! Recovering the moorings is really our number-one priority on this field trip, so everyone is both excited and anxious whether we will be able to recover all of the seven moorings in this section. Ron has already contacted three of them yesterday evening, so that is a very good start. Contacting a mooring works as follows: Ron sends out a signal to the mooring at a given frequency. If the mooring receives this signal it will respond with another signal. Because these moorings are in the water for a very long time (three years in this case), the release switches are programmed to be asleep two thirds of the time and awake only one third of the time to save battery. The mooring only responds if it is awake, so it may take a few minutes to get a response. Once the mooring has confirmed that it is still in the position where it was left three years ago and awake, we go towards the mooring and check that there is no ice overlaying the site (or if there is a little and it is not too thick, ‘just push it away a little bit’ with our icebreaker). Then Ron sends out another signal to lure the mooring to the surface. This signal opens the acoustic release that holds the mooring down to its anchor. The floatation devices that are attached to the mooring line rush upwards to the surface. At this point everyone stares over the railing to try and be the first one to spot it. Today the weather was so calm that we could actually hear them come up, so it was easy. 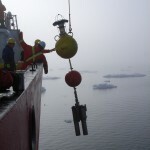 When the mooring is spotted, the FRC is launched with two crew members, who tow the mooring to the boat and attach the heavy things one by one to the crane. Then the crane tows them up to the deck. 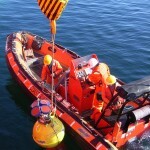 Recovering an Acoustic Doppler Current Profiler (ADCP) mooring in 2009. The first four moorings were recovered before lunch (which is from 11.30 to 12.30 here) and it looked like we were going to set a new record today. The fifth mooring after lunch also came in according to plan, but then our luck had run out. The sixth mooring refused to respond, no matter how long we tried. After a while we decided to try and contact the seventh mooring, but again without success. We steamed to the location of the seventh mooring in the hope of getting a response, still with no success. Then suddenly the sixth mooring decided it was willing to communicate after all. Apparently it had just been having some puberty issues refusing to wake up, but now it responded to our mating call. Quickly we steamed back to the site of the sixth mooring, opened the released and successfully recovered the mooring. We tried to get into contact with the last mooring, but unfortunately it was all in vain. We will probably try again on the way back, but we may need to accept that the mooring is just not there anymore. The scientific successes and endavours of this day were celebrated at the bar that night with a drink. It was a long, eventful and in the end scientifically successful day. As has been mentioned before on this blog, Dr. Renske Gelderloos, from Oxford University, is a fellow traveler on the CCGS Larsen this summer. She, too, is blogging about her experience. Below we reblog her post on the helicopter trip, another exciting and beautiful account of doing science in the Arctic, this one even with a couple pictures! [Note that the pictures in the blog post are from other trips to the same area — limited internet connectivity to the ship does not permit transmission of current images.] We will post some of her other entries here, but you can find her blog directly at this link. Today started with a nice surprise! During the eight-o-clock science meeting after breakfast the chief officer popped in to say that the helicopter would fly out for an ice survey and that it could take two extra passengers. I immediately volunteered, and as Allison and I had never flown in a helicopter before we would be the lucky ones today. 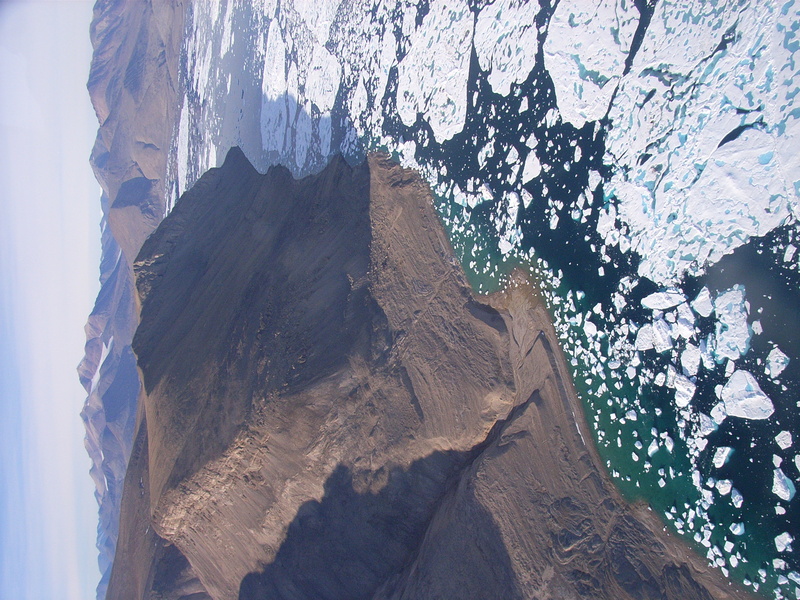 Ice along the Ellesmere Island coast viewed from the helicopter during an ice survey in 2007. Together with helicopter pilot Don and ice surveyor Erin we flew off in northeasterly direction. Erin’s job was to maps the ice conditions in the channel ahead of the boat, and see whether there was possibly a better route (less ice-covered) for the boat to take. As Hans Island lay in the helicopter range, we decided to land on this island and do a quick check of the weather station there. The weather station looks like a pole on the top of the island (Hans Island is basically a bit-oversized rock…), firmly held down to the ground with three strings. On top of the pole is a weather vane that also measures the wind speed, and attached to the pole on other heights are a thermometer and a fancy measurement device that measures the incoming solar radiation. The pole also has batteries and a solar panel to provide electricity, and a communication device that sends the data to the more populated part of the world so that it is available immediately. This is unlike our oceanographic moorings under water, which we need to physically recover on the site before we can get the data. Dave had asked us to take photos of the instruments, so we landed the helicopter for a close look. All the instruments appeared to be in remarkably good shape. The previous time this weather station was serviced a polar bear had taken a fancy on it, but fortunately none of the kind had happened this time. 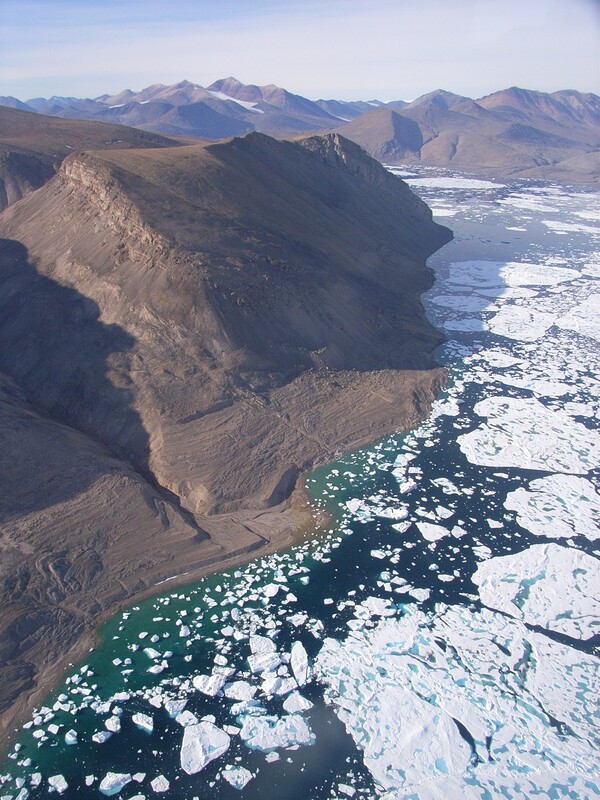 When we had done all our duties we flew back over Ellesmere Island to see a glacier from closer by: astonishing! At the end of the day we finally arrived at the site of our mooring array. 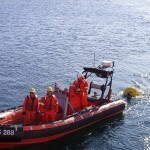 As we need the deck crew for mooring recoveries (in particular for the crane and the FRC, which is the small inflatable boat that can be launched from the ship), and the deck crew on Canadian coastguard vessels works from 8 to 5 on weekdays, chief scientist Humfrey decided to do a CTD (Conductivity-Temperature-Depth) section first. This had the additional advantage that we would have the CTD data from this section and the moorings overlapping for an intercomparison between the two. Around 7 o’clock in the evening we were ready for the first trial cast. We had already done ‘dry’ tests, which means we just checked whether the computer was willing to talk to the CTD sensors and the other way around, and whether the values we got were somewhat reasonable. The quantities we measure are the conductivity, the temperature and the pressure. From those quantities we can calculate the salinity of the water (the other way to measure salinity is to take a water sample and take it to a laboratory, so by using the conductivity of the water we can measure the salinity at every location from the surface to the bottom which gives a lot more information than just a few samples), as well as the density. For a CTD cast the sensors are tied to a frame, and the frame is lowered, using a winch, from the deck to the water and subsequently from the surface to just above the bottom of the ocean. The data is sent to our computer real time through the cable that is holding the frame, so we can do a visual inspection and get all excited during the cast. After the trial run things started to really speed up and everyone took up a task. Humfrey supervised, Jo did the winch, Dave (after a subtle hint) kindly provided tea with goodies (thanks Dave! ), I monitored the data on the computer screen and made sure the data was saved, and Andreas did a quick-and-dirty first post-processing of the data which enabled us all to see the results of our measurements in almost real time. Just before midnight the section was completed, I took some pictures of the midnight sun and we could all go to sleep. Starting at 8am sharp yesterday, we recovered six of seven moorings from the 300-400 m deep ocean floor. Only one is still left. The attention to detail three years ago, when we deployed the moorings, paid off. We are now parked next to a massive multi-year ice floe for a night without darkness at 80:43.0 North latitude and 67:17.9 West longitude. For the last 3 hours our group celebrated today’s success at the only bar within 300 miles while downloading an incredible amount of data from instruments to laptops. Among the three of us from Delaware we got 5 computers. The groups from British Columbia, Canada and Oxford, England are no different. Science is both a social and an individual activity, as oceanographer Henry Stommel said with true wisdom. There is lots and lots of scientific computing taking place right now, well past mid-night, when most aboard are sleeping. The recovery of a sensor package begins with sending acoustic signals to an acoustic receiver attached to a tiny motor at the bottom of the ocean. After waking up said receiver near the bottom of the ocean, we send a command through the water with sound waves to turn a motor that separates a hook from a heavy anchor. 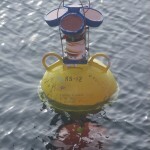 Buoys attached above the acoustic release raise the entire sensor package to the surface. A zodiac with Chief Officer Brian Legge and a Leading Seaman aboard heads out to grapple the surfaced instrument package that is then hauled aboard the ship by a crew led most competently by bosun Don Barnable. Once aboard the ship a flock of scientists, engineers, technicians, and students crowd over all the elements of the sensor package to document, detach, secure, and move all the many pieces of the mooring. The ice-profiling sonars originally designed and developed by our Chief Scientist Dr. Humfrey Melling was abused by PII-2010 the most. Two instruments moored 8 km apart were hit in almost identical fashion with ¾ inch thick protective stainless steel attached to the vibrating ceramic plates was bent into strange shapes by more than 80 meters thick ice. Data are downloaded right now to pin point the timing of the impact, but I am pretty sure it was PII-2010 in September of that year. In addition to the two ice profiling sonars that measured ice thickness overhead from 2009 through 2012 at better than half hourly periods, we also recovered two acoustic Doppler current profilers that measure ocean currents in 40 different layers from the bottom to the surface. Furthermore, two moorings each measure ocean temperature, salinity, and pressure (CT/D) every fifteen minutes for the same 3 years complement the available data. The survival of the CT/D is remarkable for the mooring string contains instruments at 30 meters below the surface. Since our ice-profiling sonar at 80 meters depth was hit by PII-2010, these much shallower CT/D moorings were also hit by PII-2010. Their slick and smart design to slip through cracks and hooks on the underside of the ice made them survive the certain strikes by ice and ice islands. This was a long and eventful day when we perhaps accomplished 80% of the tasks we set out to accomplish in the 8 days we have in Nares Strait. Our design decisions made 3 years ago paid off as we recovered almost all equipment hopefully holding 3 years of data. These 3 years of data include both the 2010 and 2012 calving events from Petermann Glacier, but they also contain data on the physical context within which these dramatic events took place. Our work has only just begun … as we are preparing to encounter Petermann’s 2012 ice island … I stop here at 1:11 am local time, cloudy skies and lots of ice around. “Recovered first mooring at 80.7 N and 67.7 W. Ice profiling sonar was hit by ice 100-m below surface, light damage on guard rail, but transducers look ok. Clear skies, light winds from the south, and air temperatures of 1.9 Celsius provided optimal condition. Never before did we recover a mooring this quickly: acoustic interrogation was less than 5 minutes, another 2 minutes after release command the mooring popped up in open water 300 feet from the ship, zodiak lassoed mooring, and 20 minutes later all was aboard. It does not get better than this … attention to detail by Dr. Melling’s mooring group (Joe, Ron, Dave, and Dave) in 2009 paid off.